IsObstructive Sleep Apnea a Cause of Seizures? | What’s the Link between Seizuresand Sleep Apnea? Sleep apnea is a serious disorder that influences more people than they believe. Actually in 1990s around 24% males and 9% females were affected by it. At present, due to increase in the fat people, there is much possibility that the numbers of sleep apnea sufferers are also increased. On the other hand, seizures and sleep apnea can be a big issue also. Is Obstructive Sleep Apnea a Cause of Seizures? It is difficult for obstructive sleep apnea patients to have a sound sleep at night. This type of situation makes them exhausted and creates difficulties for people who have neurological issues, for instance epilepsy. Therefore, people who don’t get sound sleep at night will frequently get seizure attacks on the higher side. This is why treating obstructive sleep apnea can be fruitful for seizure and sleep apnea patients. There are highly widespread ways of treating obstructive sleep apnea that are by losing weight and modifying your lifestyle. Such steps can assist sufferers to overcome their sleep issues. Nevertheless, there are sufferers who also require CPAP appliances to treat their OSA for a faster and better effect. Ongoing researches have clarified that obstructive sleep apnea can play role in seizures. The recent study carried out on 130 grown-ups who were epilepsy patients discovered that there was a 30 % occurrence of obstructive sleep apnea and a 15 % occurrence of moderate-severe obstructive sleep apnea. Several research studies have discovered that positive airway pressure (PAP) therapy put positive impact for the people who were suffering from upper airway surgery. Nevertheless, it is imperative to remember that very few patients took part in this study and therefore, it is quite hard to verify the beneficence of these therapies. One more study carried out at Cleveland Clinic to better understand the connection between obstructive sleep apnea and seizure through retrospective evaluation. The team viewed grown-up epilepsy patients who had gone under polysomnography in between 1997-2010. Moreover, they made three groups of patients. Patients who had no OSA symptom were put in the first group, patients who got treated with PAP were put in the second group and the patients who did not get any treatment of their OSA were put in the third group. The result of 132 patients was that the second group who got treated with PAP had shown better results than others. Though the results were not extra significant, however, PAP helped in improving sleep apnea and seizure cases. It is required to have additional research in this area so that the scientists can comprehend the connection between sleep apnea and epilepsy. 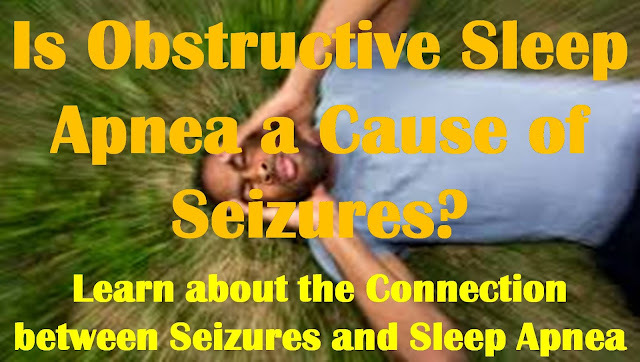 People who are suffering from epilepsy have to make certain to go under regular obstructive sleep apnea checking if OSA might be increasing their seizure. Lots of scientists think that controlling seizure is an additional benefit of curing obstructivesleep apnea.